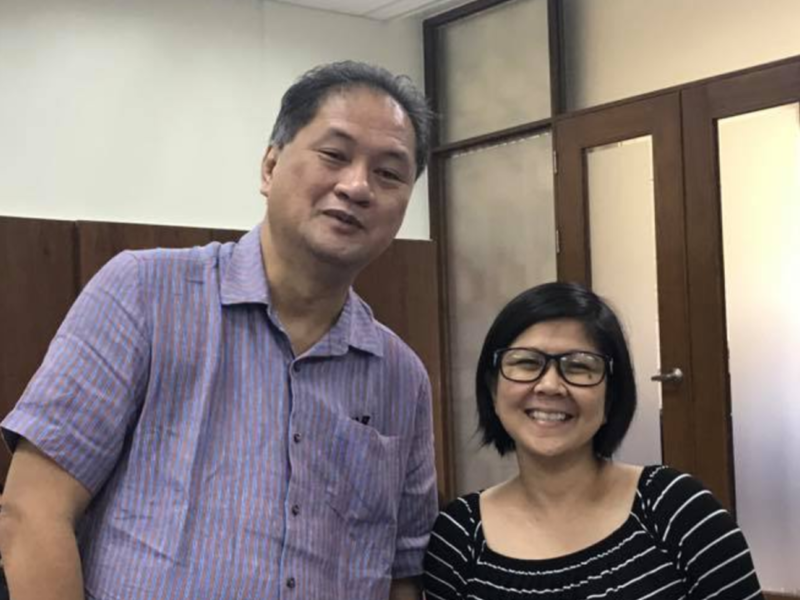 Gemma Narisma and I are happy to join the ranks of Directors of the Manila Observatory, a long line that goes all the way to Padre Federico Faura, SJ, the first director of Observatorio Meteorológico de Manila founded in 1865 and a teacher of Rizal who warned the national hero that he was heading to his death with his work. The street where the Supreme Court, Department of Justice, and UP Manila is named after Faura because that’s where MO began, inside Ateneo Municipal which is now the Robinsons Mall. If Amorsolo were alive, our portraits like our first predecessors would have been done by the master. But I am sure there are good artists out there who can do this. We are shy in having our portraits up there with the great scientists of MO but have decided for historical purposes that it would be best to continue the tradition that goes back more than a hundred years. I am the 11th and Gemma is the 12th director in 152 years of continuing research, unbroken even by revolutions (1896, 1986) and two world wars. Out of the 12, four have been lay persons. The other two are Santiago Simpas and my immediate predecessor Toni Yulo-Loyzaga. Aside from Padre Faura, other legendary scientists have worked in the Observatory: Fr. Jose Algue, SJ, who followed Faura, is also commemorated through a Tondo street; Fr. Manuel Selga, SJ, who relinquished his Spanish citizenship to continue to work in the Philippines; and Fr. Francis Hayden, SJ, whose work is honored by Georgetown University who has named its Observatory for him. More recently, Fathers Francis Glover, Victor Badillo, Dan McNamara, Peter Walpole, and Jett Villarin, all Jesuits, worked in or led MO. Currently, Fr. Sergio Su, healthy and still as sharp as ever at 95 years old, is the only Jesuit working full time with us. What was once a vibrant Jesuit community of scientist-priests is now a group of lay scientists, majority of whom are women and many in their 20s and 30s. We are now working to transform this group to a strong Ignatian community dedicated to do science that matters for the country and especially the poor, motivated by a desire to do our work on climate change and disaster risk science excellently for the greater glory of God.